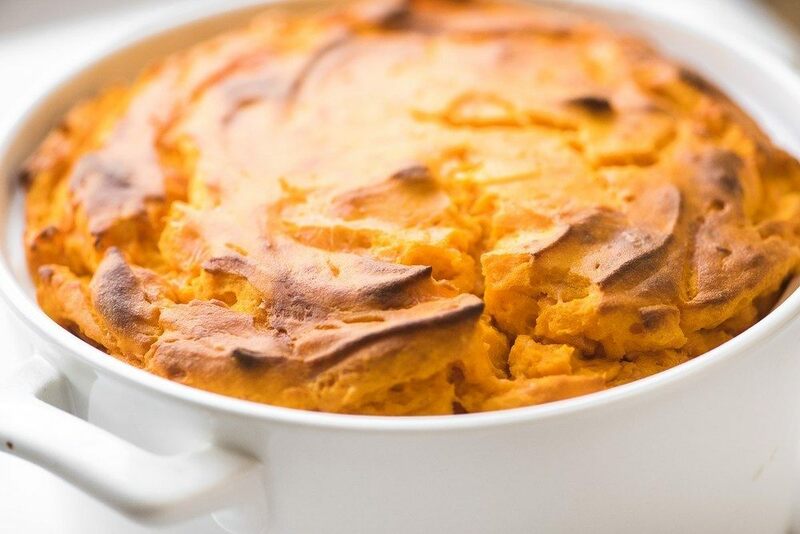 This fluffy carrot soufflé is made super quick and easy in the blender. Pair this colorful side dish with your Easter ham, or your favorite spring meal! a two pound bag of carrots, peeled, trimmed, and cut into one inch slices. Preheat oven to 350F and lightly butter your baking dish. I used a round 2 quart dish but you can also use an 8x8 square baker. Bring a pot of water to a boil with a teaspoon of salt and add the carrots. Gently boil the carrots until they are tender. (Check with the point of a sharp knife.) Drain. I'll add the drained cooked carrots, butter, and sugar, and blend until the mixture is completely smooth. Pour the mixture into a bowl and stir in the cheese, flour, and baking powder. Pour into your prepared dish, spreading out evenly. Bake for about an hour, or a little longer, until puffed up and just beginning to brown (cover loosely with foil if it seems to be browning too soon.) It shouldn't jiggle in the center, or look wet inside the cracks.